For decades, the holy grail of the major typewriter manufacturers and independent inventors alike was the design of a typewriter that was practically silent in use and would rid offices of the disturbing endless clacking noise of typebars striking the platen. Underwood, Remington, L.C. Smith, Continental, Ideal and Olympia all tackled the problem by boxing in their machines and using padding to muffle the noise. When you remove the side plates of desk machines made in the 1920s and 1930s you sometimes find lead weights taped to the inside of the plates to stop them 'drumming'. The problem was eventually solved not by muffling the traditional clacking noise, but by a unique typing action. 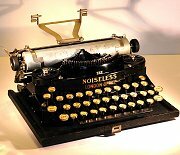 The true noiseless typewriter was the result of a collaboration between C.C. Colby of Quebec, and one of the most prolific of typewriter inventors, Wellington Parker Kidder. Kidder designed the Franklin, an almost-portable little desk machine with a curved keyboard, and the Wellington, a thrust action machine that was also made under the names of The Empire in Canada and Adler under licence in Germany. In 1896, Kidder patented the sliding type bar (above right) which acts something like a piston in a cylinder. The familiar clack clack of a typewriter results from the type bar striking the platen with force; Kidder's mechanism meant that, in theory, the type bar could be constrained to stop exactly at the platen, eliminating noise. From 1904 to 1909 Kidder and Colby invested a reported half a million dollars developing a noiseless machine and in 1912 began its manufacture at a factory in Middletown, Connecticut. This first machine, however, was a commercial disaster. One of the designers employed by the fledgling company came up with an entirely new concept and over the next five years several models based on the new action were produced in small quantities. In 1917, the Noiseless Number 4, the first practical commercial machine began to be mass produced (see left). The elimination of noise was finally achieved by a unique 'trellis' action, which stopped the type exactly as it arrived at the printing surface, and the use of a steel platen in place of rubber. The Noiseless Typewriter was even equipped with an extra quiet bell to discreetly signal the end of the line! In 1921, the desk model was joined by the Noiseless Portable. In 1924, Colby and Kidder sold the invention to Remington, who took over production and, with minor modifications, continued to produce noiseless desk and portable models until 1969. One early modification was to change the steel platen back to a conventional rubber one. In the late 1920s, Remington and Underwood exchanged patents and this enabled Underwood to start offering a machine that was almost identical to the Remington Noiseless under license. Underwood continued to make Noiseless Portables until 1939. 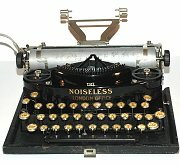 By a curious chance, the physical shape of the noiseless portable happened to fit perfectly the streamlined Art Deco contours favoured by designers in the 1920s and 1930s and the resulting Noiseless Portable is considered by many collectors to be one of the most beautiful typewriters ever designed.